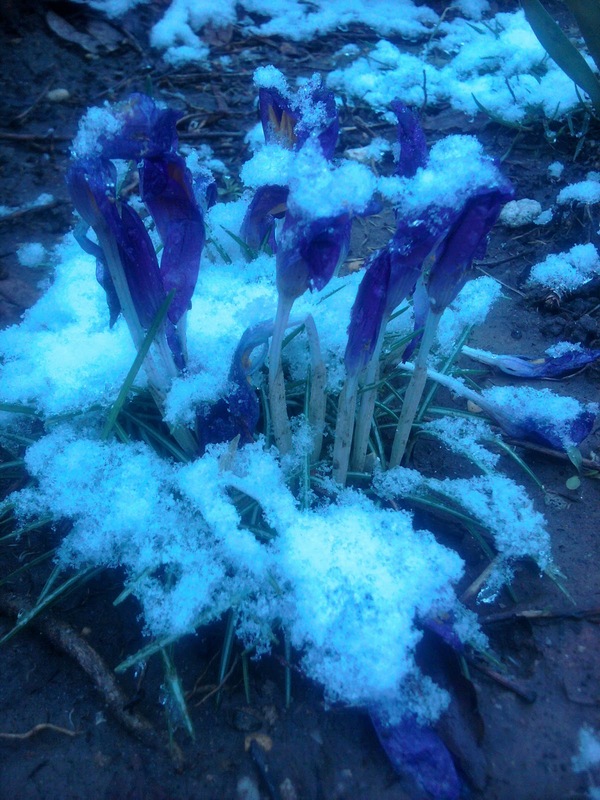 The hearty crocuses in our front yard now covered in snow. 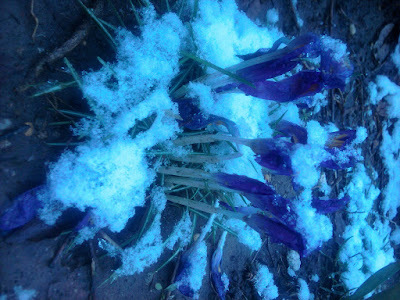 In Brooklyn, we awoke to snow on the ground for the second day in a row. We are still moving forward into Spring... although this wintry mix has us all thrown. Sometimes a frozen day is just an optical illusion! Here's my story: I prepared (for 3 days) an outstanding blog posting on a recent design event I attended in NYC. This blog was pretty comprehensive... chock full of inspirations, information, photos and corresponding links to artists and designers I wished to share with my readers. I incomprehensibly (and stunningly) accidentally deleted it. I tried for nearly 2 hours to retrieve it, to no avail. So, rather than just cancel a blog entry today and curse the computer gods... let's instead look at what simultaneously is on my desk top. And let's remember there are no accidents. This beautiful video was posted on the incredible website Crystalinks. This is a website devoted to all metaphysical topics. The founder, Ellie Crystal, practically invented the blog over a decade ago. I couldn't believe the synchronicity of our recent blog postings. I watched this video with tears streaming down my face! This clip was shared by friend, Matt Wade, this morning and absolutely made my day... Incidentally, Matt is the CEO of Talisman Guidance Solutions. Talisman: from Greek word "telein"means "to initiate into the mysteries." How rich is that?! Divine Design. I am a part of the Great Creation. Isn't it amazing how the universe immediately shifts and hands you a situation to match your thoughts? A chance to put wisdom into action? The unseen hand has other ideas about what I should be sharing today! These videos are simply extraordinary. Aren't you incredibly uplifted knowing you are a part of this Great Creation? Isn't technology (another aspect of the Divine Design) playing an extraordinary role in our enlightenment and spiritual development... (especially when we delete stuff)? Wishing you all warmth and joy on this early spring, snowy morning. Happy weekend! I've had "often a bird" in my head all morning. A great musical composition. I am touched and influenced by your trust and openness to the Universe. I witnessed the Northern Lights in person once. There must be something greater at work here. Just had my own personal experience with what is probably Divine Design. Great blog, Angela. I am happy to know you. Keep up all the hard work. Your voice makes a difference. Thanks for sharing, those videos are astonishing. I love your note to self (and there's a bit of synchronicity on my blog post too!) Glad I swung by, via SITS.